Herbal cosmetics for dry skin. 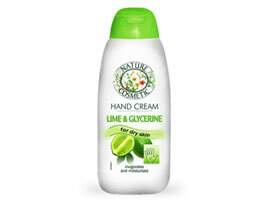 Action: Glycerin effectively moisturizes the skin and protects it from drying out and extract lime is nourishing action. Dosage: A small amount of cream is rubbed into the hands after washing. For external use only. Storage: Keep the reach of small children.